If you own a smartphone, then you should also realise you own a mini-scanner. I didn’t get the benefit of using such apps during my school or college life. I got a good smartphone during my college last semester only. When you own a smartphone with a good camera, you can easily take pictures of the notes your teacher has written on the board, you can share it with your friends who missed the classes or you can use them for studying later. If you are a school or college student, or if you are professional, you can use your smartphone’s camera to scan documents and whiteboards easily. But, not using your smartphone’s default camera app, but with an app we are going to suggest. We are going to use Office Lens for performing this. This app is developed by Microsoft and it is available for Windows, iOS and now for Android as well. When you take a picture (say a document or whiteboard) using Office Lens it will trim, enhance, and make them readable. You can also convert those images to PDF, Word and PowerPoint files. Apart from this you can even save them to OneNote or OneDrive. Printed text will be automatically recognized using OCR technology. By this you can search the words in the image and you can edit them accordingly. The user interface is simple and straight to the point. When you are using Office Lens you can frame your shot from any angle and they’ll align it properly. I tried this app with some of my notes and it came out pretty well. Also saw some pictures of Whiteboards taken by my friends, they came out pretty good as well. 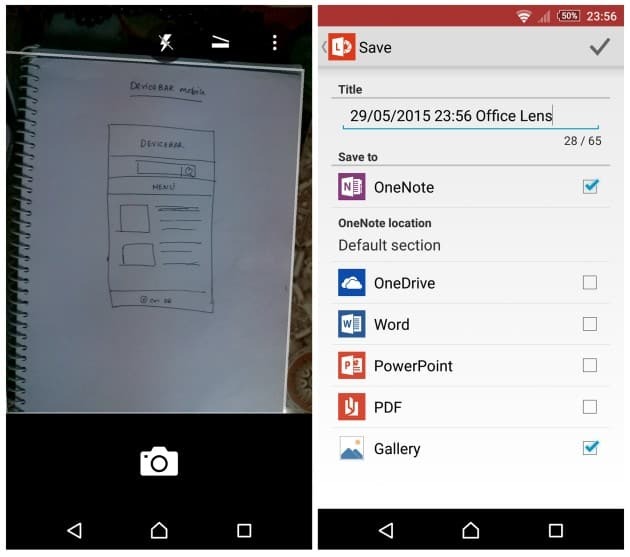 We also recommend CamScanner app and Google Drive app for scanning documents. Both are equally good. Do try these apps and let us know what you think about them in the comments below.